Bootstrap has a nice set of classes for embedding responsive videos and preserving their aspect ratios in multiple device widths. But what if you're not using an <iframe> from YouTube, etc... ? No worries. It still works a treat! 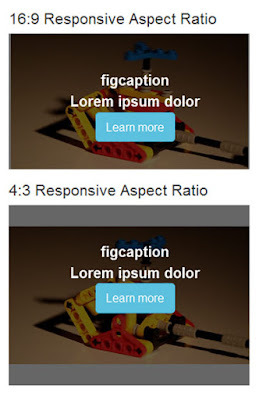 Simply add the embed-responsive-item to your <video> tag. BTW, thanks to techslides.com for the sample video. Long story short, I decided to use a figure caption. Why a figcaption you ask? Why not?! It's certainly semantic. With some creative CSS code and a font-size expressed in VW - Viewport Width instead of pixels, it will do exactly what I need in all but the hopelessly inferior browsers (bad browsers, you know who you are). If you're all new to Viewport Units here are some links. This is a screenshot at mobile width. I hope you enjoyed this introduction to Bootstrap's responsive video classes and CSS viewport units. By default, Bootstrap's Carousel component slides from right to left which is certainly fine for most projects that need a slider. Below is the default code for it. UPDATED for Bootstrap 3.3.6. By the way, my thanks to Lorempixel for the images. For a recent project, I needed a FADE transition and I wanted image captions and text to NOT be centered over my slides. 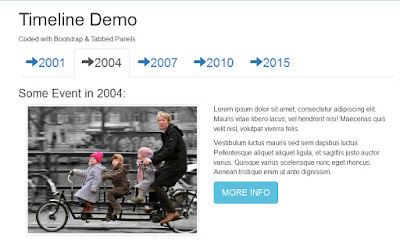 And finally, I added the carousel-fade class and a data-interval to myCarousel HTML code. Incidentally, if you set the data-interval value to "0", the slides do not rotate automatically. If you want a faster slide rotation, use a lower value. For slower rotation, use a higher value. How can I have the same navigation menu on a multi-page web site? This question gets asked a lot in web design & development forums. I like to use Server-Side Includes for this because they are powerful, flexible and efficient. Now what if you could open just one file, edit, save & upload it? Voila! New menu automatically populates to all your web pages. That's exactly what SSIs can do. And more. They are perfect for sitewide headers, footers and other global elements that you frequently use in your sites. NOTE: For this to work you must save your web pages with a .php file extension and your server must support PHP scripts. If unsure, ask your web hosting provider. Small files that contain code fragments. They are not complete web pages mind you, instead they are just bits of relevant HTML code. The default HTML markup for a basic nav might look something like this. Notice there is no doc type, <html>, <head>, <style>, <body> or other markup here. It is just the menu code and nothing more. Or if you use Bootstrap, your navbar code might look more like this. It doesn't matter what you call the include file. Although for this tutorial, I'm saving my file inside an Includes folder and naming it menu.html. Now go back to your main page and replace the empty space where your menu was with a Server-side Include Statement. This is a little bit of PHP code that calls the include file into your web page. To parse PHP includes in web pages, it's best to name your web pages with .php extension. Upload both files to your server to test -- menu.html & index.php. Be sure to remove the old index.html file from your server. Repeat Steps #2 and #3 for remaining site pages. How can I test pages in my local browser? You will need a local testing server. Get one of the following Apache servers for your OS and follow the installation instructions (5 min set-up). Can I parse Includes in ordinary .html files? This varies by web host. Some shared hosting plans allow it but many do not. If you're on a dedicated or VPS hosting plan, it's likely that you can parse .html files as .php files by amending (or creating) an .htaccess file in your server's root folder. If unsure, check with your hosting provider. A word or two about link paths in server-side include files. That's all there is to it. We hope you enjoyed this introduction to Server-Side Includes with PHP. The more you use them, the more uses you will find for them. 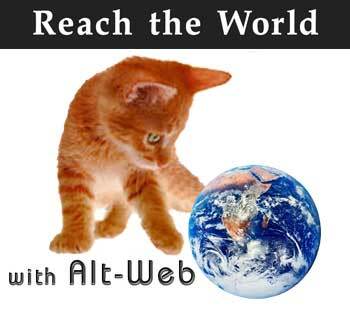 If you stumbled on to this blog from a search engine, I highly recommend reading Part 1 of this tutorial. 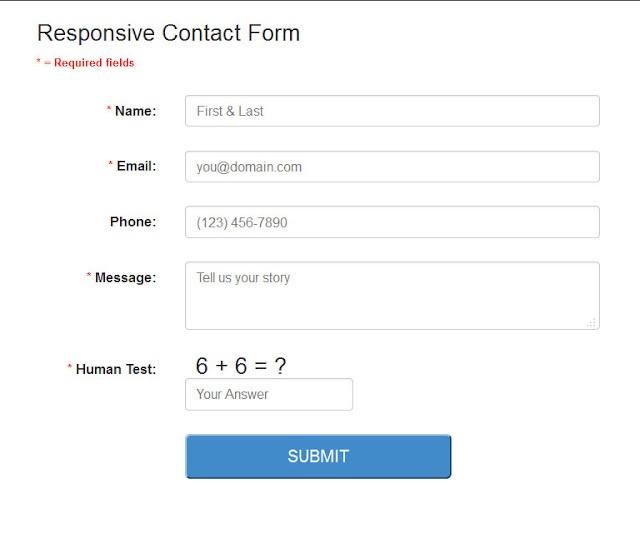 It discusses Bootstrap and the necessary structure for our HTML5 Contact Form. First, we will add this PHP code above our contact form's document type declaration or DTD. // And your server must support PHP 5.3+ and PHP Mail(). Next, we will tell the script where the form data is coming from (an address on your web server) and where it should be sent (your email address). Then we define which form fields should be included in the email you receive. Insert this code below the $human = intval($_POST['human']); code above. Next, we need to validate our form fields to ensure they are not empty and create some error messages. We want to ensure the email field is in a valid format so we will use the PHP email filter. Then we will create a solution value for the simple math problem. Spambots can't do math but humans can. This will keep spambots from submitting your form. The next step is to test_input and sanitize it. We don't want human hackers or robots injecting unwanted garbage or exploiting our forms so we trim white spaces, strip slashes & html special characters and finally sanitize data with a PHP filter. See here for more on PHP Sanitize Filters. So what's left? We need to give users some feedback. Since we're using Bootstrap, we will rely on the ready-made Bootstrap Alert classes and Glyphicons for our form submission Success and Error messages. We will insert this code just above the test_input sanitizing function above. OK. That's it for the PHP script. In Part 3 of this tutorial, we will go back to the HTML code and add Error and Success reporting to our contact form. This is Part 1 of a 3 Part Tutorial. Finally, the PHP script will send form data to your email address. NOTE: Your server must support PHP 5.3 or higher and the PHP Mail () function. If unsure, check with your web hosting provider. Bootstrap is a very popular responsive code framework. If you're new to Bootstrap, there is excellent documentation for it online. To begin our project, we need an HTML5 document with links to Bootstrap & jQuery files hosted on content distribution networks or CDNs. I'm using these because it saves you the drudgery of downloading and uploading scripts to your server. Basic HTML5 document with Bootstrap 3.2.0 (feel free to use the latest version if you wish). Next we will add a centered column block and form with some labels and input fields, a textarea for comments and a human test or math problem to keep robots from sending us spam. To style our form, we will use the built-in Bootstrap form classes. So far, so good. Here's what our responsive form looks like. Not too bad but I think it could use some CSS to make the required fields stand out more. Also we can center the form on desktops and shore up the human math problem with it's adjacent label. Add this CSS to your document's <head> tag. And here is what our form looks like now. In Part 2 of this tutorial, I will discuss the PHP code. We will define variables, check for empty fields, create error messages and sanitize input data to keep malicious hackers from exploiting our form. 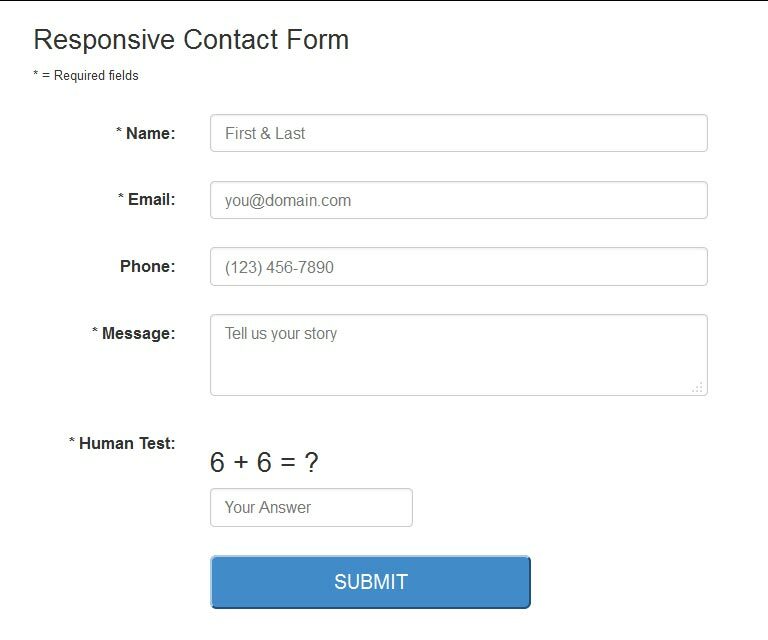 In Part 3 of this tutorial, I will show you how to connect your form to the processing script and add server-side error reporting directly to your contact form.